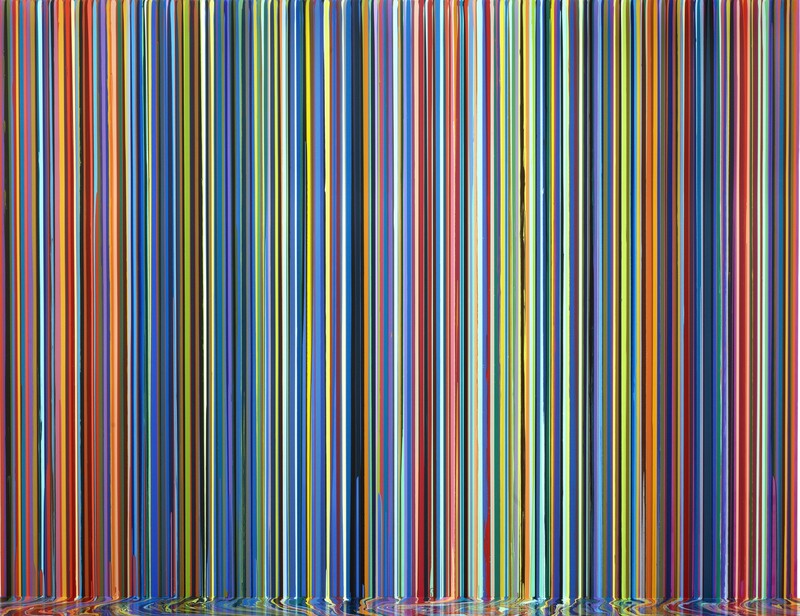 Custot Gallery is presenting Ian Davenport’s first solo exhibition in Dubai, ‘Cascade’. The exhibition will present sixteen new works, which develop Davenport’s rigorous investigation into colour relationships and the painting process. Davenport’s meticulous painting technique plays with timing and chance, allowing carefully selected chromatic palettes to ow down to the bottom of the painting. This emphasises the materiality and liquidity of his work. In two new large-scale works, ‘Mirrored Place’ (2017) and ‘Cobalt Blue Water’ (2017), Davenport has taken this technique one step further, by co-opting the intricate puddled section at the bottom of the painting, as a sculptural element. This takes its lead from Davenport’s monumental, fourteen-meter-long painting, ‘Giardini Colourfall’ at the 57th Venice Biennale, 2017. Davenport has an intuitive approach to colour, appropriating and borrowing from various sources. For a number of years, he has referenced historical artworks, such as Old Masters paintings, as a way to orchestrate more complex colour elds and sequences. The idea of borrowing and reclaiming is intrinsic to Davenport’s work and is expanded upon in the accompanying exhibition text, ‘Looking for a Steal’, written by curator and art historian, Dr. Jo Melvin. The exhibition will also include some of the artists earlier ‘Circle Paintings’ and more recent works on paper, whose energetic play with colour and application, counteract the metered and controlled pace of the poured lines.